Ashton Market Hall and Market Ground. There has been a market in Ashton for over 700 years. A royal charter to hold a market in Ashton was granted in 1284. 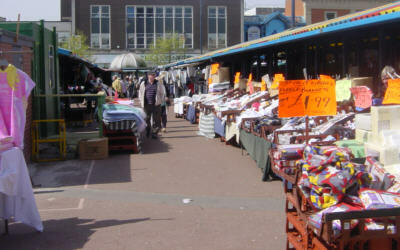 For the next 500 years, Ashton market was the focus of the area for miles around. During that time, the area was rural with most people earning their living from the land. 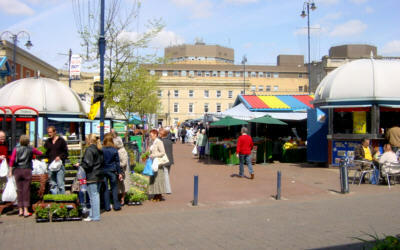 The original market was held in the square around the old market cross (now St Michael's Square at the bottom of Old Cross Street). 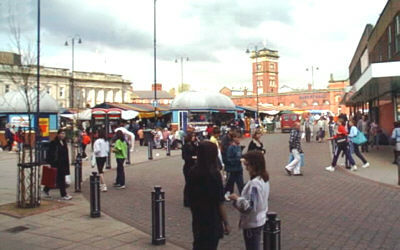 As industries developed in Ashton during the nineteenth century, the market expanded to serve the growing popularion. The present Market Hall was started in 1829 and was extended several times to its present size. In May 2004, the historic Market Hall was destroyed by fire. A new, temporary "Phoenix" Market Hall was opened at the other end of Fletcher Street from the old hall. This operated while the historic hall was being rsstored. The old hall was finally re-opened in November 2008 with an up-to-date interior that still retains some of the quirkiness of the past, but with much-improved facilities. Today's indoor and outdoor markets are a popular feature of the town for residents and visitors. The Market Hall houses over 100 stalls and there are a further 150 or more stalls on the large outside market. The Market Hall is open 9.00 am to 5.30 pm daily except Sundays. The outdoor market is open seven days a week, with the normal stalls being available on Mondays, Wednesdays, Thursdays, Fridays and Saturdays. On Tuesdays a Flea Market is held and on Sundays a Table Top sale takes place. On the last Sunday of each month a Farmers' and Producers' Market is held. Visit the Places of Interest index page to find out about more about places to visit around Ashton.